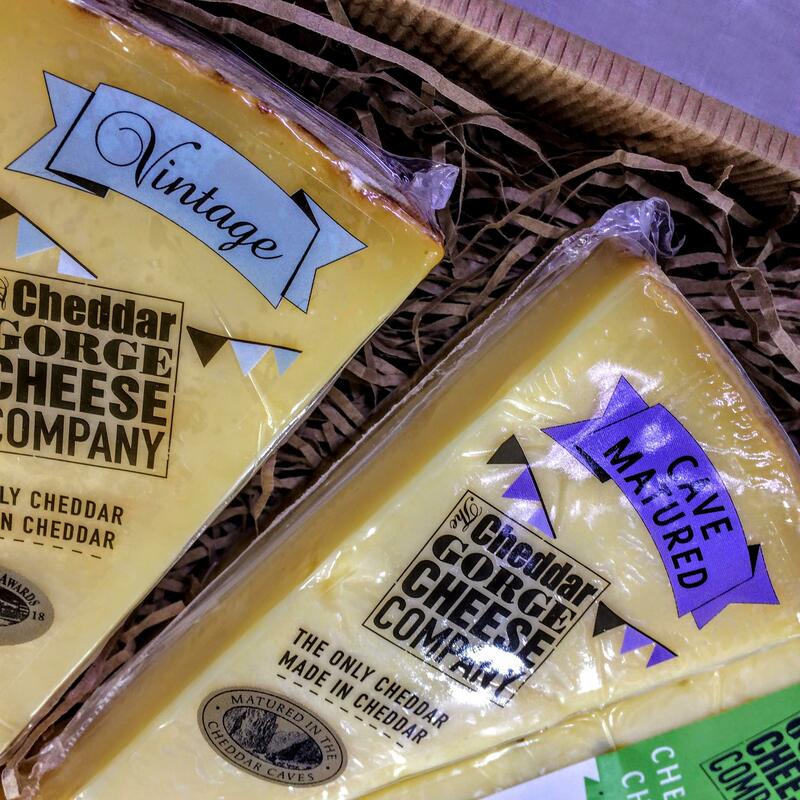 Our sample selection shown contains two of our classic authentic cheddars, along with three of our flavoured variations. You can choose any combination of our sumptuous cheeses (up to five 190g portions) to suit you. 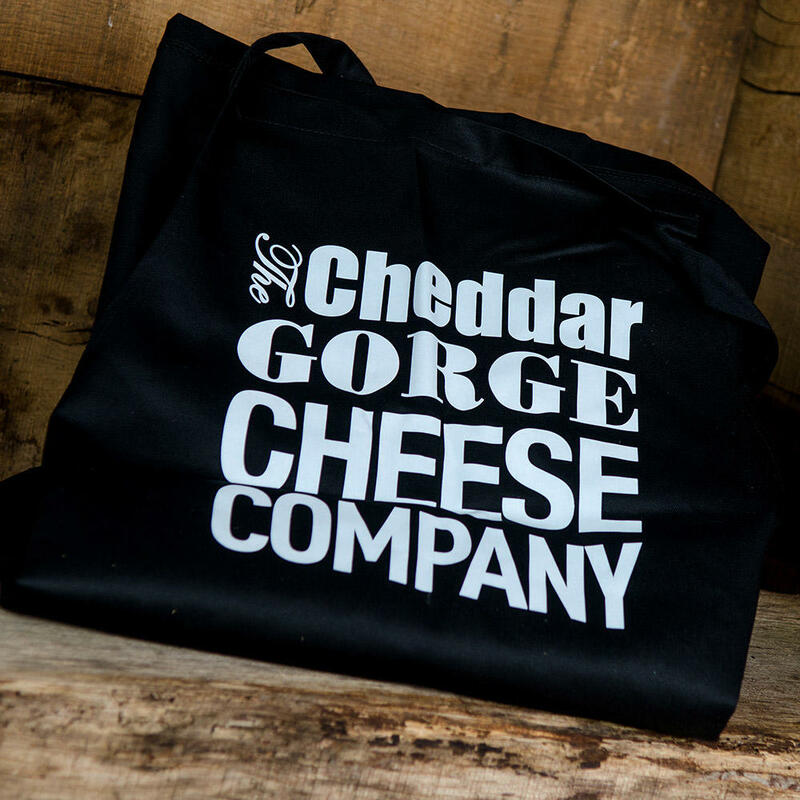 The five 190g wedges shown are Vintage Cheddar, Cave Matured Cheddar, Naturally Oak Smoked Cheddar, Cheddar with Red Onion and Tomato and Cheddar with Cider, Garlic and Chives. Use the drop-down menu to select your favourites. These, together with the lovely Red Onion Marmalade Relish (310g Jar) and Furniss Cornish Sea Salt Oat Biscuits (170g) create a wonderful combination. Again, you can make your own pickle/relish selection from the menu giving you a wide range of choice. You may also make your own biscuit choice. This makes a lovely gift. 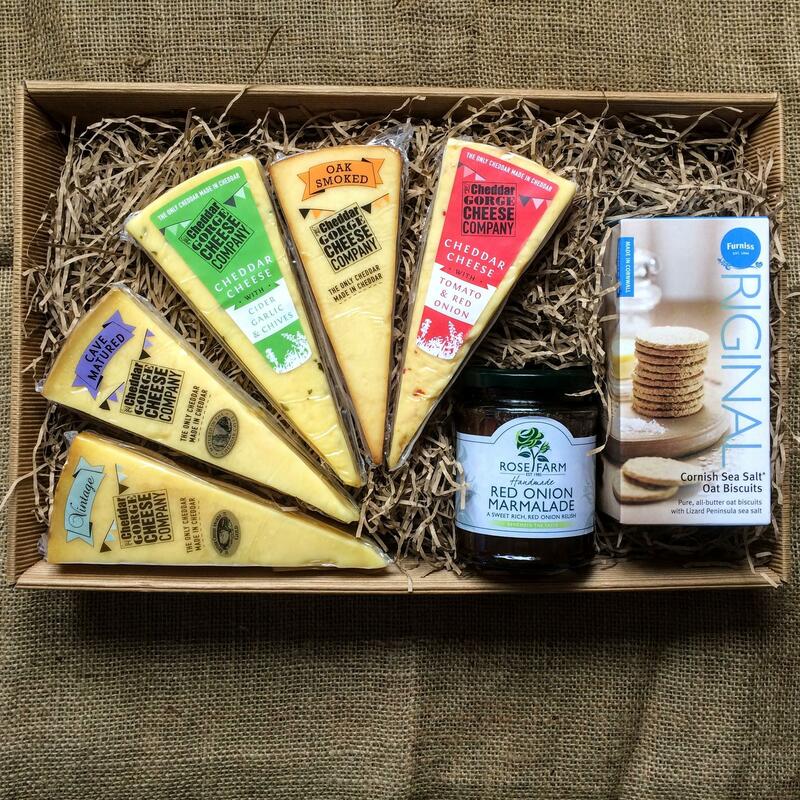 For someone who may like to sample our cheese perhaps? 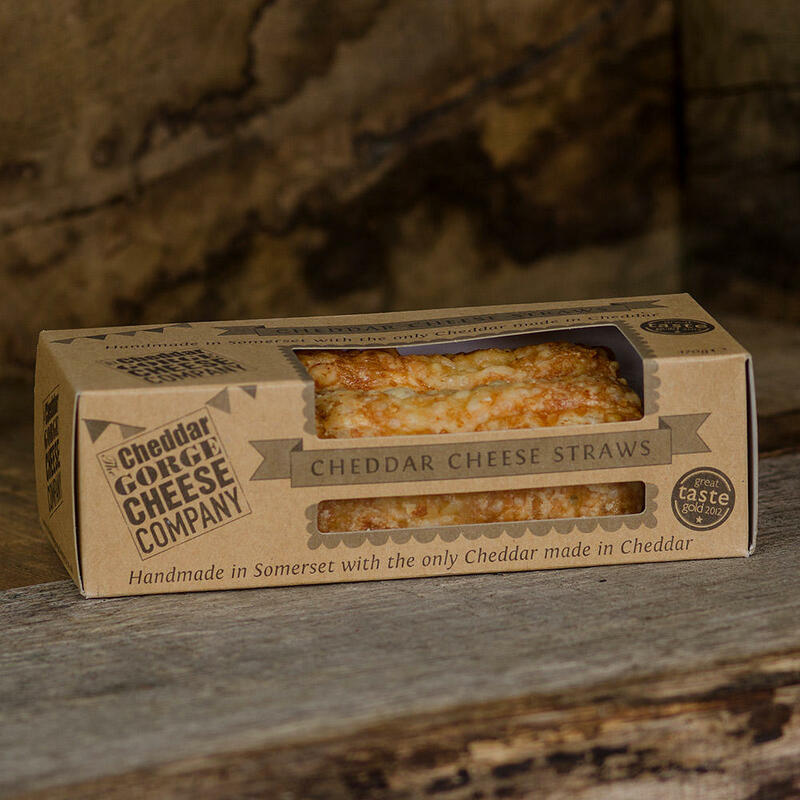 The sample selection shown contains 5 different portions of cheddar; two strong traditional, plain cheddars (award- winners) and three of our flavoured cheddars - not strong cheese, but younger more mellow cheddars matched with complementary ingredients. 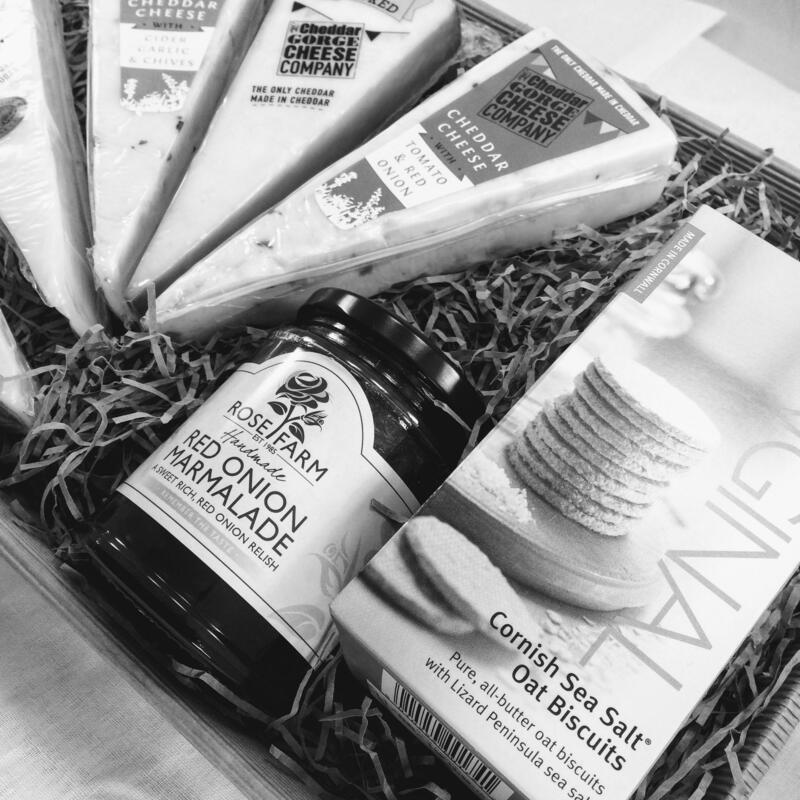 You can combine your premium cheddar with a relish or pickle of your choice, plus a box of Cornish sea salt oat or cheddar flavoured biscuits. Your selection will be displayed in a 'straw' lined fluted tray. The fluted rigid cardboard tray is approximately 210mm x 165mm x 60mm. The base of the selection tray details the best before date plus combined contents, ingredients & allergen information so that the consumer is well informed of the contents. Finally, we over-wrap with film to enclose and protect the contents.